The Eastern Washington Genealogical Society will be meeting this Saturday, February 3rd in the meeting rooms on the main floor of the Downtown Branch of the Spokane Public Library. Paid parking is available in the library garage (accessed on Spokane Falls Boulevard) or in River Park Square (linked to the library via skywalk). Some prefer to park for free down at the bottom of the Main Avenue hill in Peaceful Valley, or across the river near the Flour Mill, and get some fresh air and exercise to boot. Coffee, cookies and conversation will begin at 12:30 PM, followed by the general meeting at 1:00. Our guest speakers will be library branch manager Dennis Frederickson and other library staff, on the topic of "The Rest of the Library." We have a wonderful collection in our genealogy room on the third floor, of course, but Dennis and the staff will describe useful resources for genealogists in other areas of the library. The meeting should adjourn between 2:30 and 3:00 PM. Quite a few people, including myself, like to come early or stay late (Saturday library hours are 10:00 AM - 6:00 PM) and use the Genealogy Room, the microfilmed local newspaper area, or the Northwest Room (city archives) to do research. Volunteers will be on hand in the Genie Room to assist those with their research. Although my parents and I are the first in our family to live in Eastern Washington, I'm always interested in learning about local resources...not only do I get an idea of what I can ask volunteers or paid researchers to look up for me in the libraries of my ancestral locations (like Michigan and New York), but occaisionally I discover resources for my ancestral locations in local collections! So if your ancestors didn't live in this area, it's no excuse not to come and learn! As chairman of the Ways and Means Committee, I'll be selling nifty genealogical items as well as tickets for our monthly raffle prizes. Also available are the genealogy magazine exchange box, and workshop cassettes that can be borrowed (I once spent a summer listening to presentations on cassettes by Arlene Eakle and Roger Joslyn on finding New York resources!). If any members are interested in signing up for our computer classes, I'll have my sign-up sheets at the ready! Like those long-winded actors at the Oscars, I have an endless list of people I'd like to thank for nurturing this obsession of mine called genealogy. Always first on my list is the genealogical society member I've never met (who shall remain anonymous), who--in a Michigan courthouse 10 years ago--quietly checked my paternal grandmother's original birth record in the county birth liber to confirm the story of who her biological parents were. Then there are the volunteers at RAOGK and Find A Grave who make long-distance research possible, not to mention the wonderful people (good friends, really) at my local Family History Center and the Eastern Washington Genealogical Society who are so knowledgeable and encouraging in my quests. Recently, it's been my fellow genealogy bloggers who keep me abreast of the latest genealogy news and resources and whose virtual "high-fives" have sustained me through the winter blahs and blues. But really, I have to say that the foundation of it all was laid by family (how fitting!). My father had the Robbins' touch for story-telling. I was an only child for seven years, and remember him tucking me into bed at night when I was very little and telling me stories his father had told him of the Robbins family: of Grandpa Robbins going to GAR reunions with his Great-grandfather Robbins; of my Great-grandpa Robbins fighting in Russia during and after WWI; of tiny Great-grandma Robbins warming herself by sitting on the oven door of the old wood cook stove, and once accidentally burning her keister! Growing up in Alaska three thousand miles from extended family made them all seem like storybook characters...celebrities, even. During our stay, Mom interviewed my Great-Grandma Robbins and wrote down four generations' worth of notes of my Grandfather Robbins' ancestors. Mom knew her own family stories so well, but wanted to know more about Dad's family for the sake of us, her children, I suppose. Eight years later, I started my own family tree by filling out pedigree charts and family group sheets using the notes Mom jotted down. 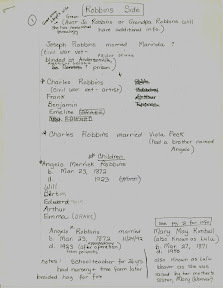 And the rest, as they say, is history...or in this case, family history. So here's to all of you; and a special show of gratitude to you, Dad and Mom, with love. We're very lucky here in Spokane to have not only a great genealogy society (the Eastern Washington Genealogical Society), but four (count 'em!) Family History Centers within the county. Not only that, but there is great cooperation between the two organizations, apparent in the annual Family History Conference held each March at the North Stake LDS Church on Regina (for you local yokels, it's the next road north of Pattison's Roller Rink). Just announced: The 2007 Family History Conference will be held Saturday, March 10, and--as always--it's FREE! If you wish to purchase a syllabus, you can pre-register, and order a printed copy ($5.25) or receive it on a CD to use at home after the conference ($2.00); you can also request a free syllabus via e-mail, available afterwards. They also offer a lunch (in the past, it's been catered by Subway, with a sandwich, chips, and bottled water). Cost: $3.75. You are welcome to bring your own sack lunch, if you prefer, or visit a nearby eatery on Division Street/Highway 395, the "Y," or at Wandermere Mall. What a bargain! Most genealogy workshops or seminars are anywhere between $20 and $50, not counting lunch and a syllabus. As usual, there are some great topics and speakers. First off, is Ugo Perego from the Sorenson Molecular Genealogy Foundation. He is the keynote speaker...and guess what! They are offering FREE DNA testing! Bring in your four-generation pedigree chart or GEDCOM to participate. You can bring in your spouse and children (age 7 or older) to participate in the DNA testing, even if they don't attend the conference. Additionally, Donna Potter Phillips and Beverly Smith Vorpahl will be speaking. You may recognize their names from a variety of national genealogy magazines (Family Chronicle, Internet Genealogy, Family Tree Magazine, Ancestry, Heritage Quest), and we are so lucky to have them in EWGS! Joyce Hawkins, who owns Huckleberry's Paper Patch (a scrapbooking supply store) in Spokane Valley will present a creative family history/scrapbooking class. She's the lady that created the multi-page handout on preservation which I give out to all my Online Genealogy students the last night of each quarter's class. Besides, Donna and Bev, Shirley Penna-Oakes and Doris Woodward are from the Eastern Washington Genealogy society, and both are great speakers as well. There are other speakers, some new (to me), and every class looks very interesting! (By the way, you'll see yours truly presenting a couple as well). So go to Grave Concerns and click on the pre-registration to see the classes available. I hope to see you there! Perseverance pays off. Sometimes, boredom does, too. Some of you know that I've been home all week with a nasty case of laryngitis; since I teach, I'm pretty much useless at work. I'm not feeling too badly; just a little fatigued, and mostly bored. So I've spent a lot of time on the computer the last few days. At loooooooooong last, I've found my 3rd-great-grandmother on a census prior to 1880. Cornelia McCLELLAN appears with her parents and two younger brothers in the 1870 U.S. Federal Census in New Haven Village, Armada Township, Macomb County, Michigan. It took some tricky searches to find them, as her father is enumerated as "Levy MACLALLEN." Cornelia herself was indexed as "Amelia" and her mother as "Charissa." Thank goodness for Ancestry's "correct an error" feature for census records! I sent in the correct and alternate spellings for all three. I still can't find these people in 1860, although I have done many rigorous searches late last night and early this morning. A search in the 1880 census for the other family members (I already had Cornelia's enumeration for that one), gave me a possibility for Levi in Detroit, with a possible second wife (Mary C.), new son (Ira, age 10), and step-son (George, age 14). This Levi matches in approximate birth year, birth place, and occupation (carpenter) my Levi of 1870. Clarissa and Edmund (probably both deceased) are nowhere to be found. There are several possibilities for William in the state. The 1900 census does not enumerate Levi, or at least, I haven't found him. I did find an Ira whose birth year and birthplace match, residing in Washington Twp., Macomb County. His occupation is a (stove/steve/? joiner). Joiners and carpenters are pretty much the same occupation, and if this Ira is Levi's son, above, it's possible he learned the trade from his father. Any of you who've done this for a while understand what I'm talking about when I say there are certain families that you can trace all the way back to the ship, with plenty of supporting documents; and then there are those that make you want to bang your head on the wall (like this family)! However frustrating the latter are, they are the ones I learn from the most. I learn to use alternate spellings, think creatively, analyze, organize my information, and simply to persevere. And these are the ones that make genealogy so interesting and rewarding! An update to my moving of posts from my Bravejournal account to this Blogger account: I've moved about a third of my posts over this week, all from December 2006 and January 2007. It takes time to move everything (not unlike changing your residence), because I'm tagging each one with labels for ease of searching. Thanks for your patience, and be sure to change your links to http://ancestories1.blogspot.com. Home again for the second day due to laryngitis, I spent time at the Tresoar website trying to scare up some leads on my earliest known HOEKSTRA and De HAAN ancestors. Tresoar is the Frisian History and Literacy Center (Province of Friesland, the Netherlands) , and is a wonderful resource of a variety of abstracted Frisian civil and church records. I found 4th-great-grandmother Fokeltje Jans De HAAN's death record abstract of 22 Jun 1847 in the municipality of Kollumerland, stating she was 70 years old and a widow. No luck on a baptismal record for her or a definitive death record for husband Marten Lieuwes HOEKSTRA. I also looked in surname registration records of 1811 to attempt to find Marten, Fokeltje, or their parents listed. Either there weren't exact matches or there were too many possible matches, and with not enough identifying information, there was no way to be sure. Most Dutch people did not have surnames prior to the Napoleonic government ordering them to register one in 1811. They used patronyms, and unless they had a unique name, it's difficult to differentiate between the many men named Marten Lieuwes at that time...especially when none lived in the Holwerd area of the Westdongeradeel municipality, which is the town in which Marten and Fokeltje married. I made sure to print out the abstractions of Fokeltje's death record and Marten's and her marriage record for my HOEKSTRA binder I'm putting together. I also spent some time adding the data and properly citing my sources (!) in my RootsMagic genealogy program. One of the (many) benefits of subscribing to Smart Computing magazine is receiving e-mail newsletters with links to some of the upcoming issue's articles, available online to subscribers only. Of interest is an editorial on a new Firefox extension called "Scrapbook." According to the article, "With the Firefox ScrapBook extension, you can store copies of relevant information, pages, and entire Web sites in one spot: the same browser window you use to track down answers." For researchers, it's a great way to keep track of one's sources while researching online. You can capture the entire page in a screenshot-type image and then save in a menu for later access, similar to bookmarking. You can also pick and choose to capture only select parts of the webpage, including tables, text, and single images. The menu appears in a left-hand sidebar, along with any folders and subfolders you create to organize them. I plan to try this extension out, and will report back on my progress. I also recommend checking out the above article when it appears on newsstands, or better yet, subscribing to Smart Computing. Here's a list of ten great reasons to subscribe. As I blogged in my New Year's Resolutions, I have wanted to keep better track of my online research and search results. When using online databases, it's so easy to lose track of exactly what you searched for, especially when refining your searches to adjust for name spellings, locations, ages, etc. I created an Online Research Form to help me document my research a little more carefully and efficiently (hopefully, no more repeating searches with the same parameters). A sample of what I have done is shown below, and you can also view a full-size version of it here (use the magnifying class icon above the image to zoom in). The purpose of this particular search is to find my 3rd-great-grandmother, Cornelia McCLELLAND on the 1860 U.S. Federal Census. This woman has been extremely troublesome to find in many records. I believe the main reason for this is that she was illiterate - she signed her name with an "X" on all the paperwork in the Widow's Applications for the pensions of her two Civil War veteran husbands. She may simply have had very little schooling, and by not being able to write down dates, had nothing to rely on except her memory. Every record in which she (or a relative) states her birthdate or her children's birthdates seems to never coincide with any of the others. The most consistent records indicate she was born in late 1856 or in 1857, in St. Clair, St. Clair Co., Michigan. I finally discovered her parents' names on one of her marriage records (she was married three times): Levi McCLELLAN and Clarissa CLEVELAND. Some of the many spelling possibilities I've come up with for this family's surname are: McCLELLAN, McCLELLAND, McCLELAN, McCLELAND, McLELLAN, McLELLAND, McLELAN, and McLELAND. Now change the "Mc" to "Mac" and you have eight more spellings! Another possibility is "M'." I could also remove the "M'/Mc/Mac" altogether. I could change the letter "a" to any other vowel, including "y," and still get the same pronunciation. The "e" could also be changed to another vowel. In addition, CLEVELAND could be spelled with or without the final "D," with a variety of vowels in the last syllable, and a variety of spellings (CLEAVE- CLEEV-, CLEFE-, etc.) in the first syllable. Levi can be a mis-transcription of Lewis; Clarissa could be Clara, Clare, or Clair, not to mention Rissa, or LaRissa. Cornelia could be Cordelia, Corrie, Connie, Nell(ie), Delia, or mis-transcribed as a male, Cornelius. Soundex searches can be extremely valuable, but wouldn't work in differentiating between McCLELLAN and CLELLAN. I'd have to search both. You can see for all these variations, I definitely need to keep track of what I am searching for! By listing every search I make for this family, I can make sure I've covered all the bases. I can also double-check previous searches when I get a brainstorm for a new spelling or nickname...or an idea of a different location they may have resided in. If you would like a copy of this Online Research Form, drop me an e-mail at kidmiff@gmail.com. I will send it to you in a Word Document. It is set up in landscape view, and you may need to adjust your printer margins for it to print properly. I hope to eventually make this available online using Google Documents or Adobe, but I haven't figured out how to do that yet! I received the newest issue of Grand River Times, the newsletter of the Grand Rapids (Michigan) Historical Society. The main article is "Backlash to Reform: The Ku Klux Klan and the Rise of New Deal Michigan." I had no idea the Klan was big in Western Michigan. Apparently in the 1920s they had quite the following. Now I wonder how my 1920s Grand Rapids ancestors felt about the Klan. As far as I know, none were involved with it (hopefully!). Matthew Daley, teacher of Michigan and Urban History at Grand Valley State University will present a program on the above topic at the Gerald R. Ford Museum in Grand Rapids on Thursday, February 8, 2007 at 7 PM. The program is free and open to the public. Although I am a former member of the GRHS, I still receive their newsletter. I have learned a lot about the history of the city of many of my ancestors through this publication. They also have a terrific website. Joining a historical society of your ancestral locale is a good way to learn about the history, photography, and biographies of the people of that area. It's not possible to join every historical society of every ancestral location, but many have terrific websites that offer much information. Use Google to find a historical society of interest. My "real-life" job is a paraeducator in special education. Under the supervision of a certificated instructor, I teach literacy and mathematics at the junior high-level, as well as assist students in their elective classes (Industrial Arts and Technology), Health & Fitness, Vocational Training, Social Skills, and Living Skills. I work with a wide range of disabilities, including cerebral palsy, Autism/Asperger's Syndrome (my favorite students), Marfin's Syndrome, Down's Syndrome, and mental retardation. I have also worked with children who have spina bifida, traumatic brain injury, and Fetal Alchohol Syndrome. 2. I enjoy different needle arts, all of which are self-taught: crochet, knitting, cross-stitch, plastic canvas stitching, and sewing. Crochet is my forte'. 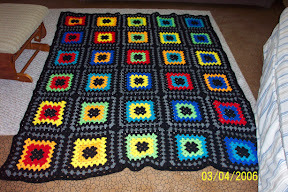 The photo below is of an afghan I designed and created for my son last year to match his bedroom decorating themes of Star Wars, Spider-Man, and other movie/comic book characters. 3. On New Year's Day 1987, I marched with The Salvation Army band in the Pasadena Rose Parade (I played the flugelhorn). As an aside, The Salvation Army (TSA) band and the Pasadena High School band are the only bands that have a standing invitation to the Pasadena Rose Parade. All others must receive a special invitation only. It is considered a great honor for any band to participate in this parade. On the other hand, I have also marched in the Butte, Montana Fourth of July parade with TSA, and that was an unforgettable experience as well (potholes, drunken miners, etc.)! Between TSA band, various school bands, and church music programs, I also have played cornet, alto horn, clarinet, piano, autoharp, concertina, and even the timbrel (in a drill-team-style group for The Salvation Army). Sadly, am no longer involved in any music groups. 4. I am a cat person. My current pet is a gray and black tabby female named Tessa, who we rescued in the neighborhood about 3 years ago. She loves to play "catch" with her rabbit-fur-covered fake mice. 5. Sometimes I wish I could duplicate myself! Then I could have enough time to do both genealogy AND create graphics. I use PaintShopPro 6, and have created many backgrounds, images, and animations, some of which are available at my graphics website, Kidmiff Kreations. Being a wife, mom of two teens (my kids drive me crazy; I drive them everywhere else! ), employee, and hobby-genealogist, I haven't been able to keep up with this. I tend to dabble in graphic creation and design much more in the summer. 1. I am a Mayflower descendant through Richard Warren (twice), George Soule, John and Joan Tilley, their daughter Elizabeth Tilley, and her husband John Howland. My children's father is a descendant of John and Elinor Billington, and their son Francis Billington. Those Billingtons! John was the first white man hanged on the North American continent (for murder), and Elinor was once condemned to be whipped for gossiping. Francis may have been the son that William Bradford wrote about, who nearly blew up the ship on the voyage over, by making a squab (firecracker) IN THE GUNPOWDER ROOM! After landing, John, Jr. got himself lost for three days, throwing the whole colony into a panic, until he was found and returned by (fortunately) friendly natives. 2. Due to the small genetic pool in colonial New England, I am related to myself quite a few times. My children's father also descends from that same Puritan/Pilgrim pool, and between the two of us, it's amazing our two children were born with all the correct number of body parts! 3. My own black sheep ancestors include 4th-Great-Grandpa Uzza Robbins, a hot-tempered blacksmith from Potter County, Pennsylvania, who murdered his son, and later his second wife (with his step-daughter nearly losing her life as well). Learn how Uzza lost his head, post-mortem, here. 4. Although I have never lived there as a permanent resident, I consider Michigan my home state. Sixty-nine of my direct biological ancestors spent all or part of their lives in that state between 1836 and the present. This includes all ancestors from my parents through my great-great-grandparents' generation, plus many in the older generations, including two sets of 5th-great-grandparents. In addition, I have 12 direct adoptive ancestors and 25 step-ancestors (married to my direct ancestors) who were also Michigan residents. 5. If I never find another ancestor, I still will consider my genealogical research to be successful, as my first goal when I began my quest was to reunite my paternal grandmother with her biological family. She and her younger brother had been kidnapped from their mother's home by her father when she was three years old, and abandoned at an orphanage. I was successful in achieving my goal, and you can read some of this story in my great-grandmother's AnceStory. There, you now know more information about me than you ever cared to learn! I hereby tag Cameron and Maureen, David Bowles, Maureen Taylor, Denise Olsen, and Dana Huff. Pass it on, folks! I feel very blessed to have had the childhood I did, although for years, I did not appreciate it! I was born and grew up in Alaska, living in mostly Native American-populated villages. My parents were Salvation Army officers (ministers), doing mission work with the various native tribes. When I was older, they built a house by hand (no power tools), and they had a little farm, living nearly completely off the land. Because of this environment, I have had rich and varied experiences that many my age have not, and can understand and relate to the lives of my ancestors who lived pre-electricity, pre-running water, and pre-supermarkets. Coming along hand-in-hand with these experiences was the assortment of foods that I enjoyed. I was born in Kodiak, whose native peoples were heavily influenced by the Russian culture. Here my parents learned to make pirok (salmon and rice pie, flavored with onion and hardboiled eggs), and kulich (Russian Easter bread - a heavy bread full of eggs and dried fruit, baked in a coffee can). Living on a minister's salary was not easy. I may be mistaken, but I believe that at that time, The Salvation Army paid its officers stationed in Alaska and Hawaii the same salary as those in the "Lower 48." This was disproportionate, since the cost of living in those two states is much higher, due to shipping charges being passed along by retailers to the consumers. I well remember eating pancakes and salmon frequently at the end of every month. In fact, salmon, so outrageously priced at my local supermarket, was as common as hot dogs are for most people during my growing up years. My parents owned a succession of several small outboard boats long before we had a car, as it simply was more practical to have a vehicle one could use on water to bring home the bacon--er salmon--with. For most of my childhood, we lived in or near the village of Klawock, on Prince of Wales Island, the third-largest island in the U.S. (after Long Island, New York, and Whidbey Island, Washington). The road from Klawock to Craig, a larger town mostly populated by Caucasians, was a treacherous 7-mile logging road remnant, and it was more convenient and less time-consuming for my parents to boat down than drive. Prices were slightly lower in Craig, and so they often did their shopping there. Later on, they would order by telephone to a grocery store in Ketchikan, and have their goods shipped over on a freighter that came to P.O.W. Island once a month. Besides the many varieties of fish (salmon, halibut, coho, red snapper - some of which I helped Dad catch), there were clams, crab, and seaweed harvested from the sea. My favorite treats were the seaweed that would be spread on sheets on the rooftops in the summer to dry, and smoked salmon (nearly everyone I knew had a smokehouse). The kids I knew growing up loved Indian Cheese (fermented salmon eggs) with eulachon oil (a candlefish), but it was too strong for me. And speaking of kids, many would go salmon fishing on the bridge that spanned the mouth of the Klawock River where it fed into the bay. Fish that were considered "too small" were rarely tossed back in the water, but left to rot on the bridge or roadside. Dad often tells how when we moved to Northeast Washington and he saw the price of salmon in the supermarkets, he would remember all the rotting fish on the bridge, and silently mourn! I hated live crabs...they always looked malicious...and you had to put them in a large pot of water and slowly boil them to death. Once a crab crawled out of a pot Mom had on the stove, and I remember her shreiking and pushing it back in with a broom handle! In addition to the bounty of the sea, the land gave as well. I don't really remember Dad going hunting, although I know he did. I do remember eating venison once in a while, although some may have been given to us by neighbors. I loved the way my mom prepared venison in a kind of barbeque sauce. In the fall, it was very common to see deer carcasses hanging off people's front porches to drain all the blood out of the meat before cutting it up. Dad once shot a bear on our front porch--which is a blog for another day!--and he and Mom made delicious sausage from the oily meat, which I loved to eat for breakfast with waffles. I fondly remember picking elderberries, blue huckleberries (erroneously referred to as blueberries by area residents), thimbleberries (a favorite of mine), and salmonberries (a wild raspberry with colors ranging from yellowish-orange to maroon). Mom and Dad made the best jams, jellies and pies. I did hate picking salmonberries, as they had thorns and their thin whip-like branches always seemed to slap me in the face when I followed Mom into the berry patches, with old coffee cans hung by our necks with strings to leave both hands free for picking. I remember always being a little nervous about black bears when berry picking, and to discourage any in the area, we would always sing loudly in the berry patches. When out playing in the woods, sometimes I would snack on wild currants, but I never remember anyone picking any to make jam or anything else with it. After my parents started their little farm, Mom experimented with drying ground salmonberries on waxed paper in our egg incubator, and came up with some great fruit leather. Wild asparagus, a green about four inches high and a quarter-inch in diameter resembling the domestic asparagus, could be found near the beaches, and I liked it with butter and salt. But I disliked goose tongue, another wild green that looked like long, wide blades of grass. When steamed, its texture was too soggy for my liking. The growing season was short and very wet (160 - 180 inches of rain a year), so mostly root crops flourished in my parents' garden: potatoes, carrots, turnips and radishes. There were also peas, lettuce, cabbage, kale and rhubarb. Dad tried strawberries in a barrel, but they never amounted to much. He had a green thumb, and grew beautiful roses, tulips, morning glory and honeysuckle, in addition to the vegetable garden. On the farm, which we liked to refer to as the homestead, we raised goats, rabbits, pigs, chicken, ducks, and geese. Dad brought in Pygmy goats, because the miniature adults could be shipped in dog kennels in the small engine planes that delivered to the island. That way, he didn't have to wait for (goat) kids to grow up before breeding, milking, or butchering. Some friends of ours owned a restaurant and lodge; being from Texas, they had a barbeque pit for preparing their famous Tex-Mex foods. Dad bartered and was able to have a whole goat barbequed over the pit for several days...one of the most delicious meals I've ever eaten! Of course, we drank goat's milk, and the folks experimented a bit with cheese-making, which if memory serves me right, ended up being a bit like Feta. We had two pigs at two different times, and each time Dad and Mom made wonderful sausage, as well as bacon, ham, head cheese and cracklings. The first time we had rabbit, they didn't tell me what it was, but kept making comments about how the "chicken" had four drumsticks! Of course, we had plenty of chicken, duck, and goose, along with eggs galore. Mom made good old-fashioned sourdough bread from an old Alaskan recipe, sweetened with molasses and raisins (which kept the bread moist). She would bake it in coffee cans, a good half-dozen loaves at a time, then wrap them in foil or plastic bags to keep fresh. She made this bread for years, even after we moved to Washington, and it was a favorite Christmas gift among the neighbors from our home. My parents felt it was important to starting incorporating elements of Dutch culture into our home. As a white child in a village of Indian children, I learned a great deal about the Tlinget culture at school, where we had "blocks" - elective classes in native dance and song, mythology, language, and crafts (beading, blanket making, and woodcarving). While this was certainly an enriching education, they wanted me to understand that I had my own heritage of which to be proud, and this was probably the beginning of my interest in genealogy. They determined that between them, I probably was nearly half Dutch and half English, with a bit of Heinz 57 thrown in for good measure. Being from Western Michigan, heavily populated by Dutch immigrants, they were familiar with the Dutch culture. One of the many things they did was to find a cookbook of traditional Dutch foods. Favorites included vijfschap (Five Kinds) - a beef stew with five kinds of vegetables and fruit (potatoes, onions, carrots, celery and apples) - and olie bolen (literally, "oily balls"), what we know as donut holes. My all-time favorite treat growing up (and even now) was banket (bun-KET), a traditional Dutch pastry with almond paste filling. My grandfather would make it and send it in our Christmas package from the relatives on my mother's side of the family. A huge box would arrive, plastered over with sheets of stamps. Grandpa worked for the US Postal Service in Grand Rapids, Michigan, and he, along with my dad and myself, collected stamps. The box was a gift in itself! After Christmas, Dad would carefully cut the cardboard, then place wet towels over the stamps to soak them off, later to be mounted in our albums. Inside the box, everything was packed in the Sunday comics, another treasure in itself. We were not regular subscribers to the nearest paper, The Ketchikan Daily News, and even then, its comics were in black-and-white. The Grand Rapids Press, however, had Sunday comics in full, glorious color! At the top of the carefully wrapped and packed Christmas presents would be the banket, wrapped in foil and still semi-frozen. Dad would cut the pastry into one-inch diagonal slices, and we would enjoy every bite. There never seemed to be enough! In 1997, I wrote my grandfather, and asked him for the banket recipe. At that time, he was 81 years old, and I figured I may not have many opportunities to ask him. As a matter of fact, he lived another 9 1/2 years, passing away just a few days ago, on January 6th. Every year when I make this treat for my family and friends,I think fondly of my grandfather, and next Christmas, it will be with a mixture of loss and joy. I've included the recipe here, in this very long blog, as a tribute to my grandfather. Although complicated, time-consuming, and expensive (almond paste is not cheap! ), the results are worthy! To make pastry, crumble or chop margarine into flour, salt, and baking powder mixture until mixed fine. Add water and mix well. Form dough into flat ball; wrap in waxed paper and chill overnight. For filling, crumble or chop paste (a blender or food processor can be used, says Grandpa, but I used a hand pastry cutter). Add sugar and flour and mix. Add two whole eggs, egg yolk, and vanilla and mix well. Form into a flat ball, cover or wrap, and chill in refrigerator overnight. Divide pastry and filling into 8 equal parts each. Shap pastry dough into an oblong ball. Roll the ball away from you on a floured pastry cloth into a strip about 3 inches wide by 12 - 14 inches long. Take one piece of filling and roll with palm of hand into a long rope a little shorter than the pastry strip. Roll the filling onto pastry. Brush one edge and the ends of pastry with water, fold the ends over the filling, and roll the pastry around filling toward moistened edge. Press lightly to seal and place each finished roll lengthwise on an ungreased cookie sheet, seam side down. Put 4 rolls on each sheet. Beat egg white and brush on top of rolls; sprinkle with sugar. Prick rolls with fork at one-inch intervals. Bake in preheated oven 425* about 25 - 30 minutes or until light brown. Makes 8 rolls. My grandfather, Adrian DeVries, passed away this morning at Covenant Village of the Great Lakes, Grand Rapids, Kent County, Michigan. He had been fighting aspiration pneumonia for some time and had been hospitalized for eight days over the holidays. To make him more comfortable, he was returned to his home at Covenant Village under the care of Hospice. I am happy for him that he is at rest, and reunited with my grandmother, his parents, and siblings. He was a World War II veteran, like my other two grandfathers. Grandpa DeVries was my maternal step-grandfather, but we never thought of him as a "step." He raised my mother, who was three years old at the time he married my grandmother (Mom was calling him "Daddy" when he and Grandma were still dating). He planned to legally adopt my mother, but her biological father wouldn't hear of it. He never treated her any differently than his son or daughter, and he walked Mom down the aisle when she married Dad. Eventually, I'll add his story to my AnceStories website. Distant cousin Sharon Flood sent me some notes that she had compiled years ago about Moses Crothers' family, plus a photo of his daughter Myrtle's grave.